Aedes Ars, New Stonehenge Model for Sale, Made in Spain! photo from the aedes ars website, used with permission. We should have held out for a bribe! For the first time in our two-plus years of folly, a company contacted us in advance to announce the release of a new Stonehenge model. Did we maximise? Did we monetise? No. We’re just doing another post for free, losers that we are. The kit’s dimensions are listed as 280 x 280 x 70 mm., about 11 inches square, for those who think in old units. Pretty small. All of the 121 pieces are fine quality ceramic fired at 800° C.
We’re told by the people at Spanish manufacturer aedes ars, “The main work with this kit (different of the rest of our products) is to scrape the surface of the pieces to make them irregular and to let the clay colour mix appear in the surface.” So they’re going to some trouble to make the stones look suitably old and stony, always a good sign. They haven’t quite got their English right, but we don’t score on that. Our Spanish isn’t that great, either, a decir la verdad. We like sets you assemble yourself, though. Makes it easier to use for history class dioramas, etc. While the set is of the Stonehenge-as-it-is-imagined-to-have-looked-at-first variety, you could make a good stab at setting it up as it is now. That’s a plus! We like the current, disheveled look of the grey monster of Salisbury Plain better, all in all. Score? We give it 8 druids. Nice set. Things that future model-makers can do better: 1) shape stones individually to match each real stone at Stonehenge, as they did in the exquisite cardboard Stonehenge, 2) include a larger baseboard with room for Aubrey holes and a heelstone, and more space so it doesn’t look so cramped, and 3) draw stone positions for the current state of the monument on the reverse side of the base material. Now, for those thinking of contacting us with commercially available Stonehenges in like manner in the future: we figure we should get about €2000 per druid scored! Or, you could just ask us politely like they did and we’ll probably do it for free. This is our mission: to demonstrate to the world the incredible rate at which Stonehenge is reproducing itself like a virus, using human minds as cells to incubate and create its young and thus to take over the world!!!1! The BBC Inflatable Trilithon–Bring on the Helium! photo by Thelma June Jackson, used with permission. Anyway, this is the first, and the most earthshaking, of a few posts for which we have been forced to come out of retirement, which, we find, is much less restful than one might think anyway. 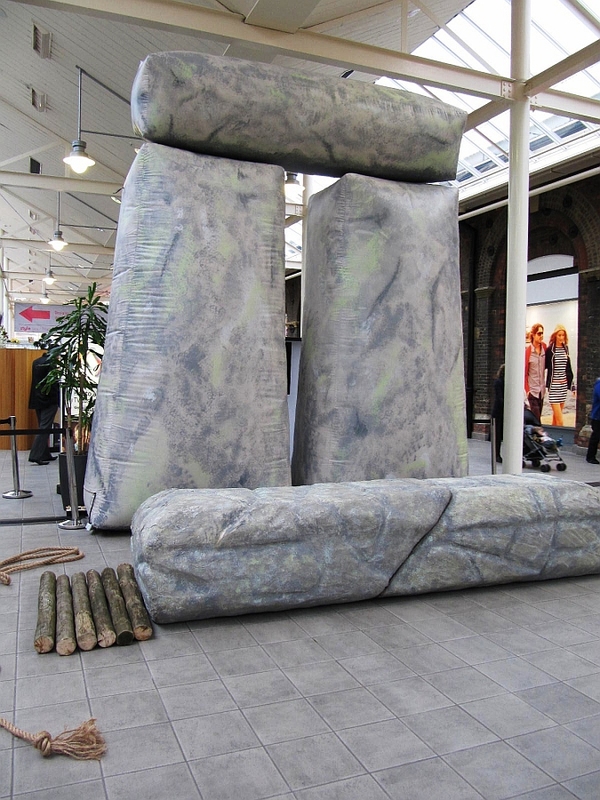 We present to you, Gentle Readers, the fabled inflatable Stonehenge! It’s only a trilithon, but with the way Stonehenge has been reproducing around the world, a full Stonehenge is only a matter of time. Just lock this trilithon in a room with one of Spinal Tap’s inflatable touring trilithons and in no time there will be little inflatable Stonehenges hopping about the fields and meadows, looking adorable while American and Japanese tourists snap away on their cameras! Exciting. Until then, this remarkable construction is being hauled around Great Britain–well, minus Scotland and Cornwall–as part of the BBC’s Hands on History tour, The Secrets of Stonehenge, for half term break. Brilliantly, people have been kind enough to take pictures the same way they might for someone who had a legitimate worthwhile blog, but for us instead! Note how the “logs” in the top picture are being used to roll the fourth “stone” in the second picture. Children and presumably some adults* are permitted to try their hands at moving an inflatable megalith. Fun! Of course, the real stones at Stonehenge are not light weight inflatables, but are huge, enormously heavy rocks. We don’t actually know that they aren’t hollowed out, though. Some, in fact, suggest that they’re filled with a very advanced sort of clockwork for which the Antikythera mechanism was just a mock-up, and that on December 21, 2012, a huge stone clown’s head will leap out of the ground in the center of the circle while the stones play, “Pop goes the weasel!” Frankly, it’s no loonier than much of what we hear said about Stonehenge, so who knows? The illusive inflatable Stonehenge finally appears on Clonehenge. We’ll post one again when it’s listed in next year’s Ann Summers catalogue. Finally inflatables will make it possible to live two great fantasies at once. Humph. And people say the future isn’t bright! *Those who, unlike one adult we won’t name (but who rhymes with Feet Crastonbury), could be trusted to approach the inflatables without attempting to pop them. NEWSFLASH!! As of April 19, 2012, the inflatable Stonehenge dream has been even more fully realised! Click here for our post on Jeremy Deller’s inflatable bouncy Stonehenge. Humbling to see mankind reach its highest purpose in our lifetimes, is it not? Update on Esperance–Australia’s Pink Stonehenge Going Forward! Photo from the Esperance Express. This is an update to our post (Stonehenge Recycled, Australia Tries Again) on the proposed Stonehenge replica in Esperance, a town on the south coast of Australia. (Claim to fame? When pieces of Skylab fell there in 1979, the town of Esperance charged the United States for littering.) Our thanks to friend of the blog Matt Penny, aka @salisbury_matt, once again, for sending us the link to this article. It doesn’t sound as if any stones have yet been erected, but the article does say, “According to Mr Beale the site has been soil-tested and initial works have begun in working out where the stones will go. It is hoped the project will be finished late March to early April.” So plans to erect the stones must be in place. Right? We hope. Of course there appear to be worries about pagans worshiping there (Oh, no, Trev, someone is honouring the earth again! Can’t have that, Nige! ), as if pagans will only worship in your area if you build a Stonehenge for them. But the couple doing the building reassures the locals that Stonehenge may not have been a pagan place of worship at all (Whew! ), so all is well. For us, the good news is simply that the project seems to be going forward. Esperance will soon be home to “the world’s only life-size granite replica of Stonehenge.” (Apparently they don’t consider Rothberg’s Circle of Life in Connecticut a true Stonehenge replica, which is kind of true.) We are eager to welcome number 67 to our list of large permanent replicas! Just hopethey don’t charge the U.K. for littering! Post script: Esperance, Australia is also famous among “a-flock-alypse” followers as the site of at least two mass bird deaths a few years ago. Many people believe the deaths had to do with high lead levels, while others insist the cause is still not known.